Whether a pocket square, piece of jewellery or a simple scarf, an informed accessory can add an interesting point of difference to any outfit. Gene Kelly’s umbrella, James Bond’s lighter, Michael Caine’s glasses or Gianni Agnelli’s watch; the list goes on of accessories which are remembered for their role in building up a character. Because accessories, apart from being obviously practical, offer the wearer another outlet to express their individual style in subtle yet interesting ways. Whether using a jovial pocket square to lighten a business suit or wearing your Grandfather’s ring imbued with sentimental value, an accessory can add as much or as little to a look as needed. Here are a few of The Rake’s top choices to start your collection. I thought it best not to speculate this week and choose items from the list that I actually own, and can attest to their usefulness in my daily life. Though there may be nothing intrinsically life-changing about a wallet, a scarf and a cigar case, it is important to remember that reliability in life is everything, and these are nothing if not reliable to me every time I leave the house. Also, the fact is that each of these, once you look past their purely functional properties, are indeed special and different. The Russian reindeer hide is idiosyncratic because of its origins (shipwrecked for two centuries off the coast of England), the hyper-eccentricity of the Rubinacci scarf is beautiful to behold, as well as perfect in all seasons, and the Fallon keeps your cigars healthy and ready for ignition in a way that no other case has managed to do. Altogether it is a holy triumvirate of accessories. Not just reserved for summer, a good pair of sunglasses always comes in handy for the low winter sun. Don’t let the name put you off this Bespoke Dudes pair, which is carefully constructed in Italy; they are lightweight, made of brass and feature a pleasingly rounded lens design. Forget fedoras. When it’s cold, wear a beanie. It is the 21st century. Armour Lux’s nautical blue and white striped example is an excellent homage to the Breton T-shirt, in hat form. The only other accessory desperately required is a simple wallet or cardholder. Try G. Lancelot, whose Lohty bi-fold is made from a rich brown grain calfskin that’ll age beautifully. Dressing for the cold is one of those tasks that very quickly loses its novelty, and with frosty temperatures still plaguing much of Europe into March, its exciting sartorial possibilities have well and truly diminished. New accessories are an easy way to renew enthusiasm for harsh conditions: a fresh pair of gloves, to keep the frostbite at bay; a bandana, as an alternative to all those roll necks; and a handy, hold-all bag, to make carrying all those layers a little less daunting. In the last two months, I have misplaced my wallet - twice - on public transport. By some miracle, it’s been returned both times, thanks to my Rake business cards being found inside, and the kindness of strangers. I’m pinning my hopes on Ettinger’s bright red card holder to catch my eye next time I (inevitably) drop it somewhere on the Central line. I’ll also be zipping it tightly into Frank Clegg’s chestnut backpack, which is my favourite thing on the website at the moment because it reminds me of one that I had years ago and – you guessed it – lost. Apart from my keys, wallet and phone, I never leave the house without my watch, sunglasses and jewellery. I can’t pretend to own the limited edition Bvlgari for Revolution but, boy, do I wish I did. It’s sleek, lightweight and monochromatic, plus it has a ridiculously clever movement. Whether it’s sunny or not, sunglasses provide the perfect excuse not to talk to someone deplorable who you just so happen to bump into. Oliver Goldsmith, in my opinion, rules supreme as its frames come straight out of the history books, but are very contemporary with colourful acetate and toned lenses. Finally, I’m all for man jewellery, but simplicity is key and Alice Made This definitely knows that. My father always says that the one day you leave for work without an umbrella is the one day the heavens will open up and, funnily enough, he's been spot on. The George Cleverly umbrella from its coveted Russian Hide collection serves its purpose splendidly, whilst also making the awful weather seem less so. 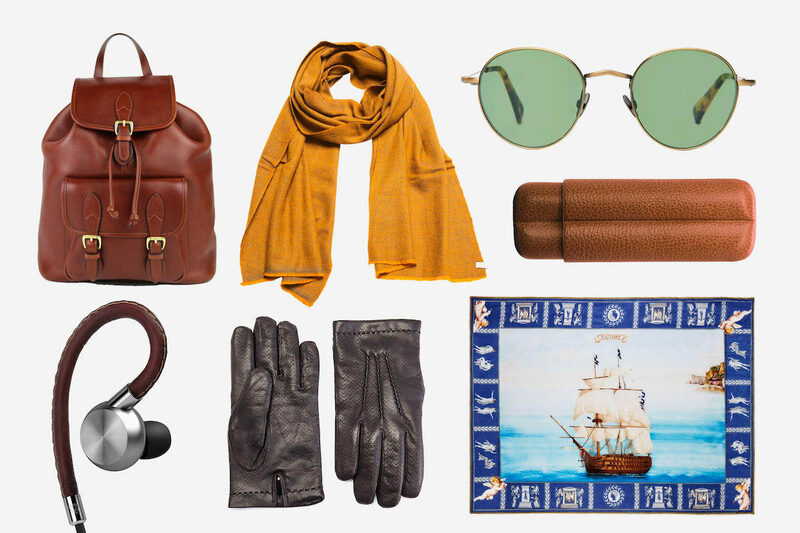 Other entirely practical and easy-on-the-eye accessories to keep your ensemble on top form is the Mark/Giusti leather documents cover and, of course, a pair of Aedle aluminium and leather headphones to offer some much-needed respite from a busy working day. Accessories are useful for one of two reasons: their practicality, or their ability to enhance an outfit. Frank Clegg’s navy leather backpack, however, combines both functions. A deep interior and a buckled front flap pocket allow plenty of space for anything from a laptop to a change of clothes without sacrificing on aesthetics, while the smooth tumbled leather ensures it's suitable for smart occasions. A well-chosen pair of glasses will give you a refined sophistication for business meetings, and this leather case will keep your cherished Montblanc pens in place as you dash between them.